Champhai is a commercial town in Mizoram and since it is situated close to Myanmar, it is also an important site for business with the neighboring country. It is also famously known as the ‘Rice Bowl of Mizoram’ and with its many hills, orchids, monuments, monoliths, abundant wildlife and the beauteous surroundings, Champhai is definitely one of the most popular tourist destinations of Mizoram. Though each village of Champhai is worth visiting, here are five places that you need to go to for a memorable visit. With lush evergreen forests, the Murlen National Park is home to many endangered species. It is spread around 100 sq km and there are a host of species of wildlife and birds. Some of the animals found here are leopards, tigers, Serrow, Barking Deer, Himalayan Black Bear, Sambar and more. It is also a great spot for bird watching and some of the bird species that have made the park their habitat are Hill Myna, Peacock Pheasant and also several others. Another attraction are the various beautiful and amazing types of orchids. A visit to the park during the rainy season means you get to watch moving clouds, the hills shining in its raw beauty, and the raindrops on the trees and more. With great connectivity, be it via, road, rail or air, Murlen National Park can be easily reached from any place in Mizoram. If you wish to see a spot that looks just out of the world, then head to Rih Dil in Champhai. 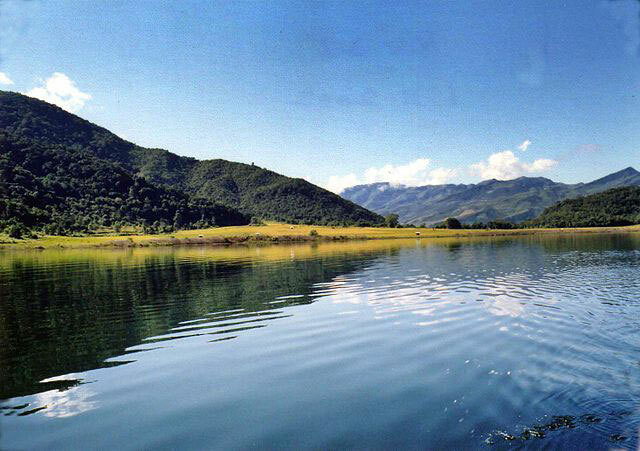 It is a beautiful heart-shaped lake which is also very close to the heart of Mizoram, as it is one of the most loved and revered lakes in the state. A unique feature of Rih Dil lake is that though it is located in Mizoram, a part of it is in Myanmar. It is also the largest lake in the state and the south-west part of the lake is believed to be deeper than the north-west part. If you look at a photograph of Rih Dil Lake, you will feel as if it’s a beautiful painting, as it has such amazing scenic beauty. The lake is closely associated with Mizo culture and it is believed that spirits have to cross the river to reach their next abode. You can also find the lake’s mention in the literature and art of Mizoram. Thasiama Seno Neihna is a plateau which is a nature’s delight and gives a great view of the surroundings. The climb to the plateau is a little difficult and hence it is a trekker’s delight. But once you are at the top, you will have an experience that you will cherish for a long time because it is a place that is full of beauty and serenity. There are many legends associated with the place, which make it a must-visit. Mura Puk is a site for history lovers, as visitors can visit six caves that are truly a marvel in terms of their construction. There are no authentic records regarding the existence of the caves but there are several folk stories about them. Spread around an area of 80 square kms, Lengteng Wildlife Sanctuary is home to several animals, birds, trees and plants. The second highest peak of the state is within this sanctuary. Some of the fauna present in the sanctuary are Kleej Phesant, Barking Deer, leopards, Sambar, Hoolock Gibbons, tigers and more. For those who love nature and abundance of culture, Mizoram is a must-visit. In Mizoram, there are many places that are blessed by Mother Nature. In fact, each and every corner of the state like Champhai is a delight to spend time in.